The LOSAT weapon system is operated by a crew of three. The vehicle carries four ready-to-fire missiles. 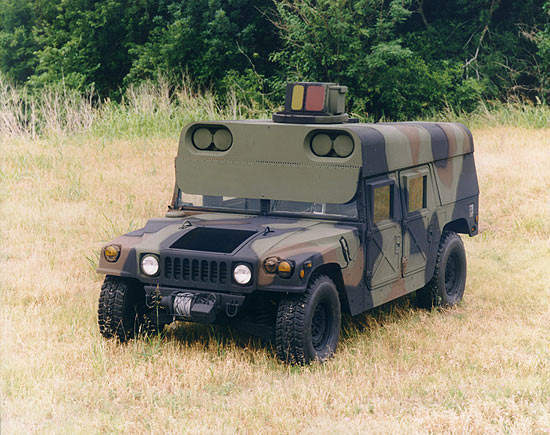 The complete LOSAT HMMWV vehicle and weapon system can be air transported by helicopter and transporter aircraft. The kinetic energy missile is internally guided along the flight path, receiving guidance updates from the targeting system aboard the launch vehicle. The LOSAT line-of-sight anti-tank weapon system. Two LOSAT vehicles can be transported by C-130H aircraft. 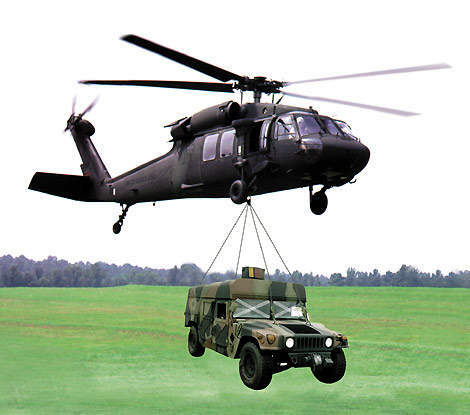 LOSAT can be delivered &ndash; ready to fight &ndash; to the ground commander by UH-60L sling load. LOSAT provides decisive lethality against all known or projected armour threats through the year 2020. 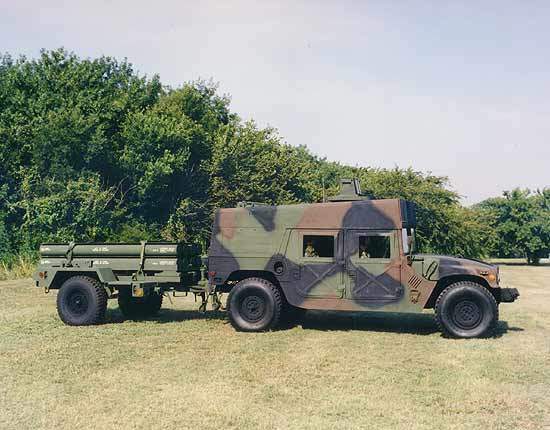 LOSAT consists of the kinetic energy missile and its IBAS-based fire control system on an expanded HMMWV towing a resupply trailer. 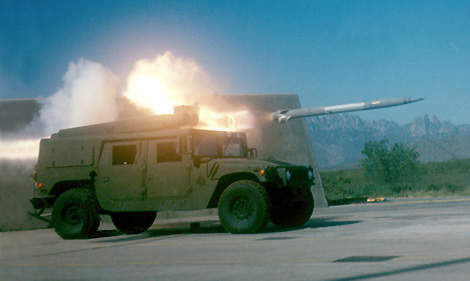 The LOSAT Line-Of-Sight Anti-Tank weapon, developed and manufactured by Lockheed Martin Missiles and Fire Control (formerly Lockheed Martin Vought Systems) in Dallas, Texas, consists of the Kinetic Energy Missile (KEM) and an IBAS-based fire control system integrated on an expanded capacity M1114 heavy High-Mobility Multi-purpose Wheeled Vehicle (HMMWV) often referred to as the Humvee. During the 1980s the US Army began considering the replacement technologies for heavy anti-tank systems. In 1990 Lockheed Martin Vought Systems (formerly LTV) conducted test flights of the Kinetic Energy Missile and a contract for the development of the KEM was placed. In 1997, an Advanced Technology Concept Demonstrator program (ACTD) was initiated. 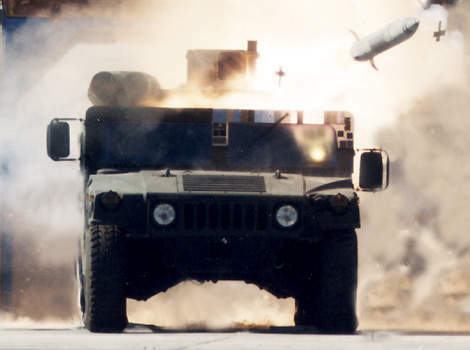 Under the program, Lockheed Martin Missiles and Fire Control is to supply 12 vehicles and 144 kinetic energy hypervelocity missiles to the US Army by 2003. In August 2002, Lockheed Martin received the first production contract for 108 missiles. The first of the 12 LOSAT units was delivered to the US Army in October 2002 and the system began a series of 18 production qualification test firings in August 2003, at White Sands Missile Range in New Mexico. The development testing concluded in March 2004. During these tests LOSAT fired 18 KEMs at various targets and successfully destroyed an M-60 tank moving at 22mph at 2,400m, an incoming tank at 2,400m, a moving target in night-time conditions at 4,300m, a moving tank at short range and a reinforced urban structure. 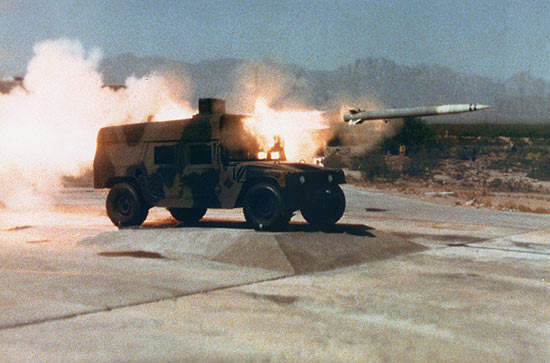 Limited user testing, conducted at Fort Bliss, Texas, was successfully completed in July 2004 with the firing of seven LOSAT KEMs. It has been decided not to take LOSAT forward into production. However, Lockheed Martin has been selected to carry out the US Army’s Compact Kinetic Energy Missile (CKEM) program, a spiral development of LOSAT. CKEM uses a smaller, lighter KEM than LOSAT. It is 1.52m (60in) long, weighs less than 45.3kg (100lb) and has an extended range of 5km to 8km. A three-year Advanced Technology Demonstration (ATD) concluded in February 2007 with the final, successful, flight test against a T-72 tank fitted with Enhanced Reactive Armour (ERA). The Kinetic Energy Missile (KEM) is a hit-to-kill weapon, which uses the energy of direct impact to defeat armour and other targets. Instead of an explosive warhead, the missile relies on hypervelocity 5,000ft/s speed to blast a penetrator rod through the heavy multi-plate armour. It reaches maximum range in less than five seconds. The system functions successfully even at high oblique angles of penetration. "The Kinetic Energy Missile (KEM) is a hit-to-kill weapon, which uses the energy of direct impact." The system is simple but innovative, in that the missile has no warhead, fuse or onboard sensor and the control mechanism has no moving parts. The system minimises the cost of the expended round. The missile, weighing 80kg, is fitted with four fin stabilisers and has a range of over 4km. The solid rocket motor for the missile has been developed by ATK (Alliant Techsystems) Tactical Systems Company. The fire control system is based on the IBAS (Improved Bradley Acquisition System), developed by Raytheon and now produced by DRS Technologies, to upgrade the Bradley fighting vehicle’s TOW missile fire control subsystem for the US Army. Sofradir, based in France, developed the 480 x 4 focal plane array for the thermal imager. The system uses a carbon dioxide gas laser rangefinder supplied by BAE Systems North America, based in Atlanta. LOSAT is capable of autonomous operation or it can be used with other systems. LOSAT is tailored to provide anti-tank capability for the Early Entry Force. The firing range of LOSAT is greater than that of current-generation tank guns giving LOSAT an advantage in strike capability. The weapon system is operated by a crew of three. An entire attack sequence from detection to destruction can be accomplished in a few seconds, at target ranges of more than two miles. The second-generation infrared sensor, which is mounted on the launch platform, is used to acquire and track the target. Once lock-on is achieved the gunner can look for the next target. The gunner can choose to engage two targets simultaneously by using both of the two target trackers. When the gunner initiates the missile fire sequence the launcher is aligned to the infrared sight and fires the round which is propelled towards the target. "LOSAT is tailored to provide anti-tank capability for the Early Entry Force." The missile is internally guided along the flight path, receiving guidance updates from the targeting system aboard the launch vehicle until the target is hit. The vehicle carries four ready-to-fire missiles. 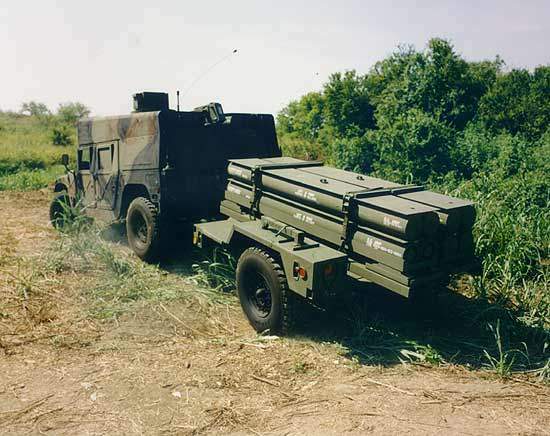 Eight missiles for reloading can be carried on a towed trailer. The crew of three are able to resupply the vehicle and be combat ready in a few minutes. 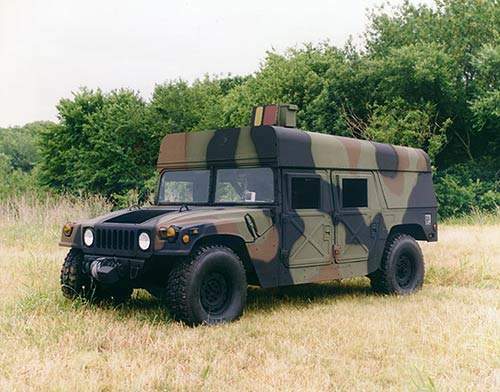 The complete LOSAT HMMWV vehicle and weapon system can be air transported by helicopter and by transporter aircraft. 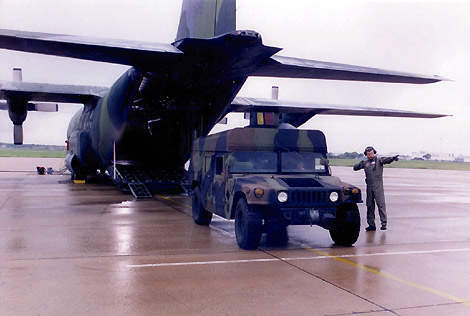 Ten LOSAT HMMWV can be loaded and transported on a C-5 aircraft, seven on a C-17, three on a C-141, and two on a C-130J. The V-22 Osprey and the Chinook CH-47D helicopter can each carry one LOSAT HMMWV externally loaded.